Sold at the Warner Bros. Studio Store, this whistle on a lanyard was released in 2001. Not only is it a useful tool to alert someone in an emergency, but it also has a built-in basic digital clock. 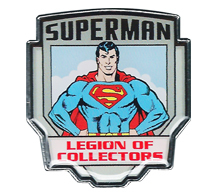 The lanyard features Velcro-like ends for easy removal and has repetitive images of an ’S’ symbol with a Bruce Timm style Superman above each of them. September 12, 2017 in NOVELTY.